The Wheel of Fortune quilt block is a simple nine patch that contains an interesting (and often forgotten) patch. That patch is often referred to as a three-quarter square triangle unit as it contains three triangles that fill a square. The patch uses both a half square triangle and two quarter square triangles which make up the final patch. 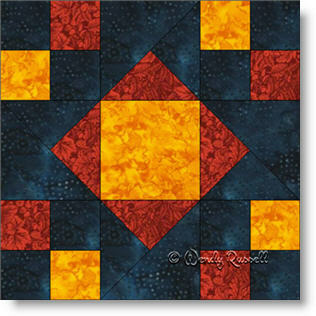 There is really nothing difficult in the construction of this quilt block so it is a good choice for beginner quilters. Colour choices can make a big different in the final effect, depending on whether you choose a light or dark background fabric for the block. The sample quilts illustrated use the basic layouts chosen by quilters for hundreds of years -- the straight set of the blocks or the on point setting with extra plain blocks to feature your quilting skills.